you don’t have to sacrifice quality for portability. We didn’t cut any corners in this design. 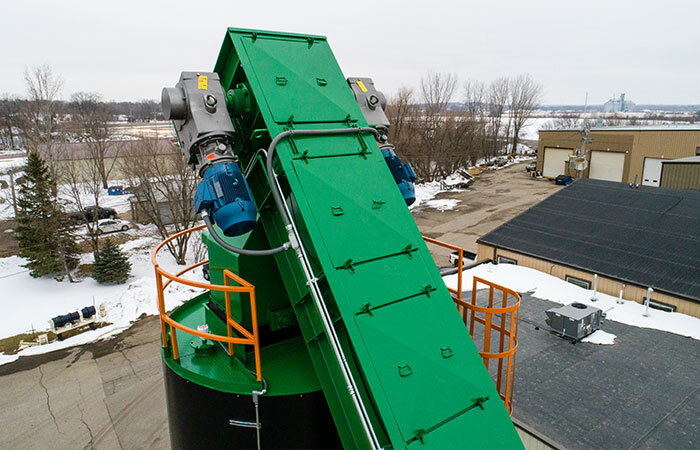 This negative weigh system provides 80 tons of short-term storage at production rates up to 500 TPH, this system allows you to get your plant up and running in no time. Our silo sets up on a prepared, level surface. A hydraulic leveling package is used to fine tune the leveling. 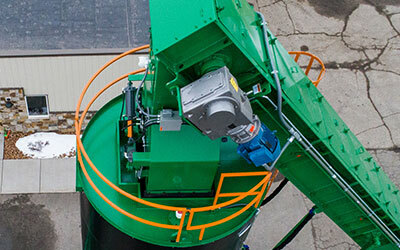 Our telescoping cylinders lift the slat conveyor which is tethered to the silo. The silo is positioned via limit switches and hydraulic locking pins are actuated to secure the silo into position. The deployment cycle takes around 15 minutes. We wanted to provide a product that would stand the test of time. To achieve this, we kept this equipment as consistent as possible to our stationary equipment. We are using the same 1” thick Ni-Hard floor liners, heavy duty, dual strand chain, cone liners, closed top design and we even insulate the silo for added storage time. A caged safety ladder allows access to the top platform, where you would have access to the batcher. 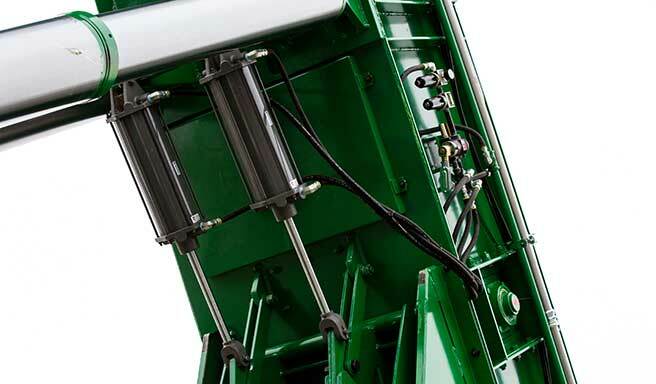 Dual, direct drive reducers are used on the drive to minimize any maintenance on top of the silo. The batcher holds up to 3 tons. The dual gate, anti-segregation design is paramount in producing quality mix. 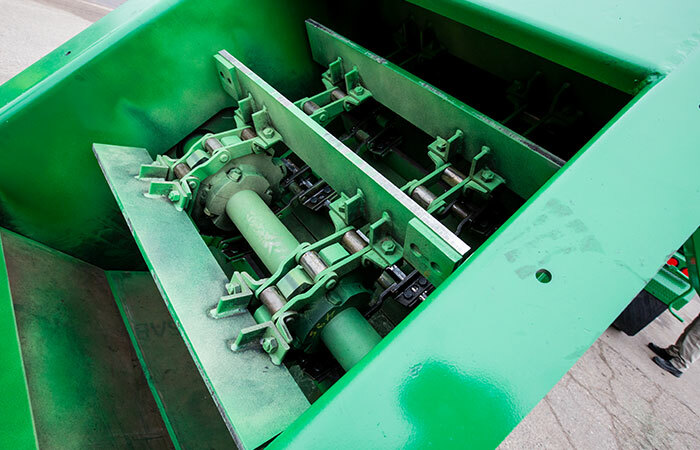 The batcher and the silo gates are inter-locked so that the batcher cannot open when the silo gates are open. The silo is a cylinder design. The cone is recessed in the cylinder, like that of a typical stationary silo. The load-cells are located at the base of the cylinder. The top of the silo is covered, keeping the heat in and the elements out. The silo has 2” of insulation for added storage life. The cone is lined with “turtle-back” liners and it can also be equipped with electric cone heat. Our gate design is a dual, timed, clam gate with a center drop discharge, minimizing segregation. 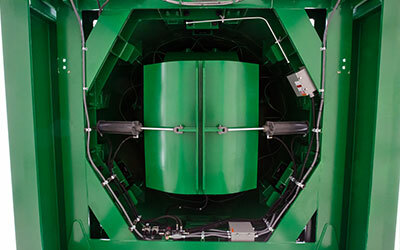 The silo rests on three equally-spaced load cells. While leveling a system that uses four load cells can be difficult, three points of contact will always find level. 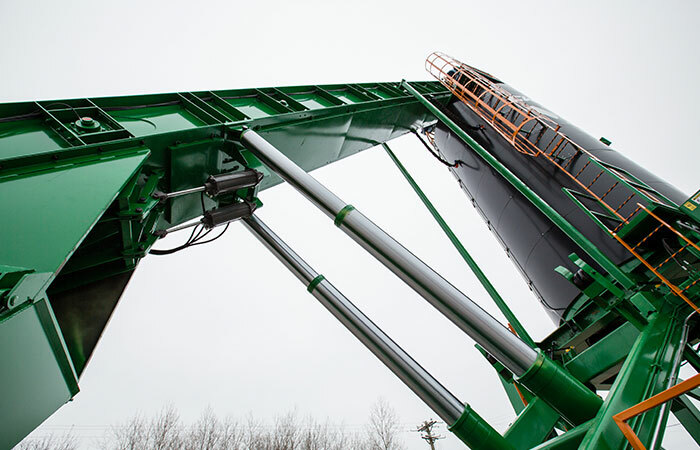 The batched weight is tracked via a load-out system. 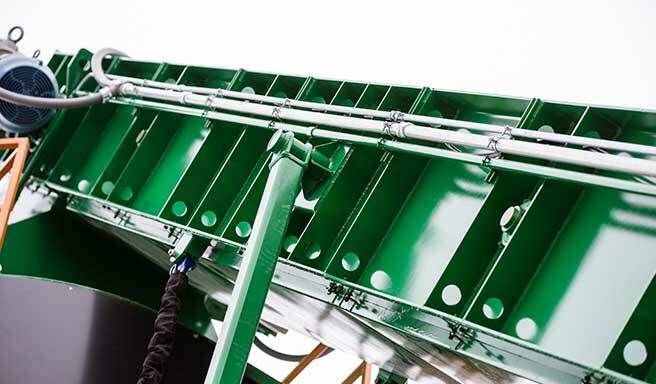 The slat conveyor is formed from INX50 steel. We incorporate 1” thick Ni-Hard liners. These liners are “L” shaped and encompass the floor and side liners all in one. We use a dual-strand Rexnord chain with ¾” x 5” x 33” large bolt-in slats. The drag chain is tensioned at the tail shaft. 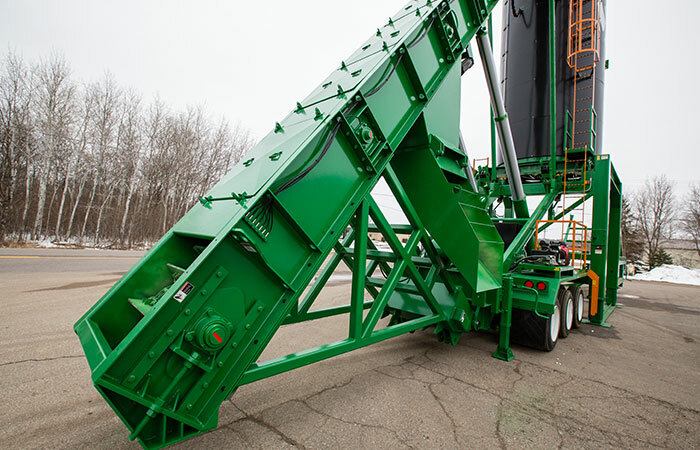 The reject gate has a side discharge chute, keeping material away from the chassis. 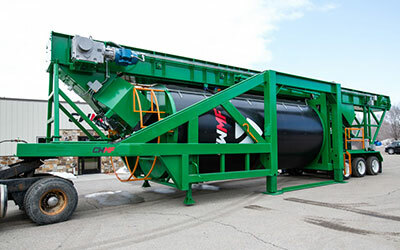 The chute can stay on during set-up and transport. Electric heat on the slat is optional. All the bearings have grease lines plumbed to a centralized location at the base of the slat. Dual direct drives with C-face motors eliminate any adjustments or maintenance on the top and balance the over-hung load on the slat. 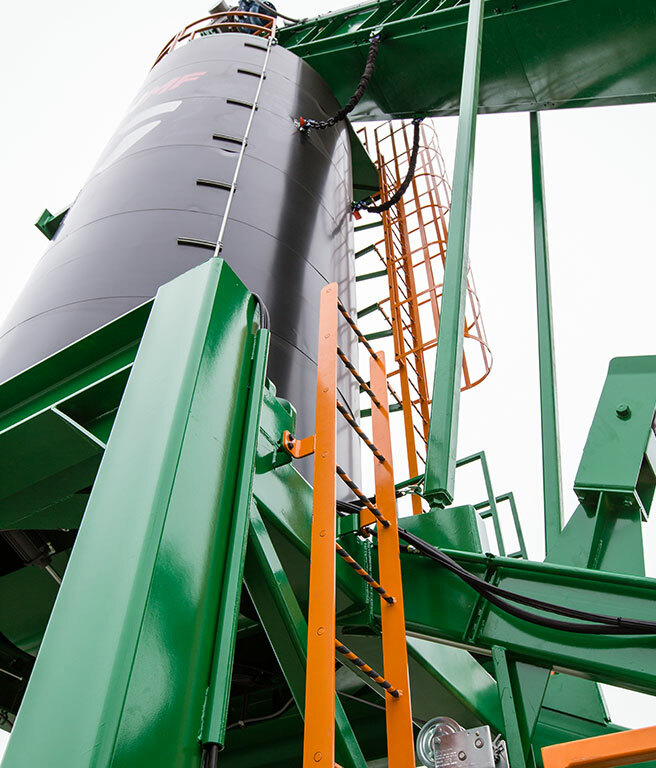 The silo is tethered to the slat and raised by dual, two-stage cylinders. The hydraulic system is powered by a Honda power unit with electric start. –Danne Pearn, Fleet Manager, Duininck Inc.